I've had this concept sitting around in my Concepts folder for close to a year now. Pretty standard concept that I think would work well for the Bruins. As much as I love the new "shield" logo of the Bruin, I do think a black alternate is overkill, considering their home jerseys. 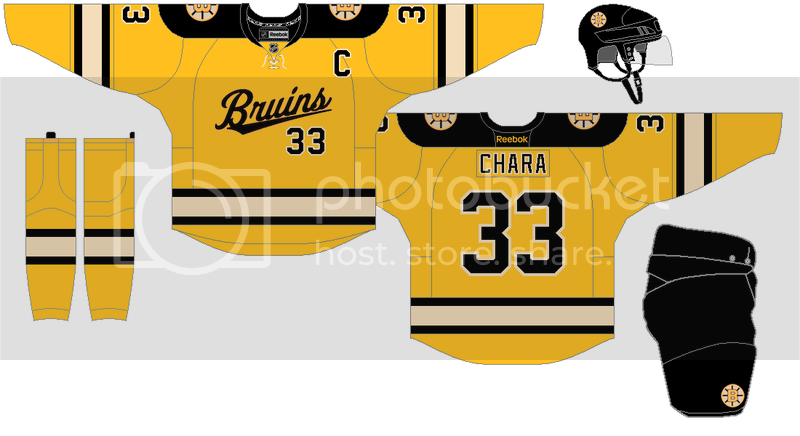 Since I'll most likely never make a brown Bruins jersey (seriously, stop making those), yellow was the next best option for me. Anyway, here goes. Exact opposite,I like the cream. It creates a different touch for the Bruins. The cream (light yellow?) threw me a bit too but I like it. My only critique is that the script looks a bit unbalanced to me without an outline. Not sure whether you should add one or remove the current number strokes. Get rid of the number under the Bruins script and it's perfect. I don't think cream works with this shade of yellow. It's too close on the spectrum and, to me, doesn't blend well.